The objective of this activity is to develop a railway GNSS receiver chain technology enabler, to support the testing and validation of integrity concepts, algorithms, and techniques for receivers in a railway environment. The study will propose a roadmap for implementation and demonstration of the proposed solution. It is envisaged that the study will be supported by key users and stakeholders, who will contribute to requirements and explore opportunities for demonstrating the proposed solution through a potential follow-up Demonstration Project. This activity aims to assess, design and test techniques for improving robustness of GNSS carrier tracking in the railway environment for railway Safety of Life applications. The activity focuses on the use of GNSS positioning for virtual balise detection in the European Rail Traffic Management System (ERTMS). ESA supports ETCS Level 3 and Satellite positioning to improve ERMTS operational performance and reduce the cost of the overall system. The feasibility of using satellite communications for rail communications is the subject of a new study prepared for the European Railway Agency by INDRA and ALG. A new rail line in Australia uses GNSS positioning for ERTMS signalling, introducing the concept of virtual balises for ERTMS Level 2 solutions. It has obtained SIL4 certification, the stringent safety integrity level which is required by train control systems. SBS RailS Phase 2.1 aims to design, build and test the first European Demonstrator of Train Control System based on the ERTMS L2 standard operating with satellite navigation and a satcom multi-bearer telecom service. The demonstrator will be tested on the Pinerolo-Sangone pilot line in collaboration with RFI that in the meantime has activated the certification process with the safety agencies. The Iris for Railway Communications study aims to perform a suitability assessment of the Iris service solution, specifically defined for the aeronautics domain, in the railway operational scenario. The Sim4Rail activity aims to specify and develop highly controllable laboratory tools for a testbed to test and support the development of PNT (Positioning, Navigation and Timing) technologies for railway signalling including applications in the European Rail Traffic Management System (ERTMS) / European Train Control System (ETCS). The testbed will support testing under both nominal and extreme conditions, including support for fault-injection testing. The objective of the CAPRESE project is to assess, design and test techniques for improving the robustness of carrier phase measurements for use in GNSS positioning for virtual balise detection in ERTMS. 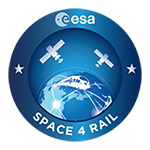 The main objective of Sat4Train is to develop a Multi Link Communication Platform (MLCP) able to use all the available terrestrial and satellite public communication services providing an innovative solution, especially for regional and in general low-traffic lines, where dedicated networks (i.e. GSM-R) are not economically sustainable.